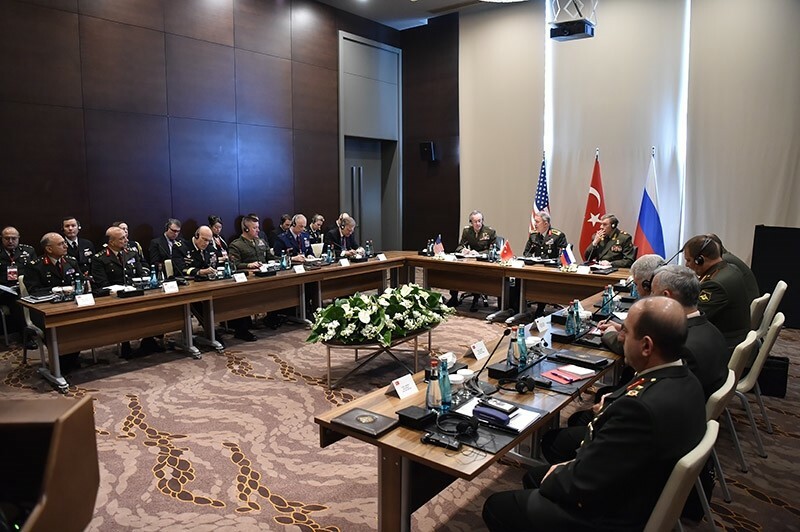 Turkish military Chief of Staff General Hulusi Akar met Tuesday with his American and Russian counterparts General Joseph Dunford and General Valery Gerasimov in southern Turkey's Antalya. 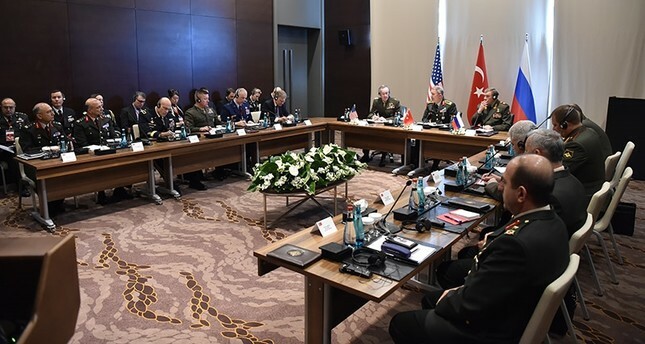 A statement released by the Turkish Armed Forces (TSK) said that the Generals were discussing security issues mainly related to the developments in Syria and Iraq in the meeting. The meeting of three generals, the first of its kind, came at a time when options for an operation against the Daesh terror group's de-facto capital Raqqa, Syria are being discussed. Another contentious issue is the status of the northern Syrian town of Manbij, where Turkey expects the YPG-dominated Syrian Democratic Forces (SDF), the main partner of the U.S. on the ground in Syria, to retreat due its ties with the PKK terror group. Russian officials have also voiced support for a takeover in the area by the Assad regime, which is backed by Russia, in recent days. Greg Hicks, spokesman for the Joint Chiefs of Staff said "the parties discussed regional security matters in Syria and Iraq, specifically the current situation of the fight against all terrorist organizations in Syria with an effort to wage a more effective fight against all terrorist organizations in the future and the importance of additional measures for de-conflicting operations." Manbij is controlled by the SDF's Manbij Military Council and the U.S. military has deployed a small number of forces in and around the city to ensure that different parties do not attack each other. President Recep Tayyip Erdoğan last week said the next target for the operation in northern Syria was Manbij after Turkey-backed Free Syrian Army (FSA) seized al-Bab. But Prime Minister Binali Yıldırım said military action by Turkey would not make sense unless coordinated with the United States and Russia. After clashing with Turkish-backed Free Syrian Army rebels west of Manbij earlier this month, the Manbij Military council declared a deal with Russia to hand frontline villages to regime control to prevent their coming under Turkish control. Ankara has launched Operation Euphrates Shield inside Syria in late August with FSA and recaptured several towns near its border from Daesh including Jarablus, al-Rai, Dabiq and al-Bab. The Turkish campaign is also aimed at stopping the advance of PKK's Syrian offshoot PYD to connect its so-called cantons along the border. A member of the U.S.-led coalition fighting against Daesh, Turkey is also cooperating with Russia in Syria. The Antalya meeting also comes as Iraqi forces backed by the U.S.-led coalition are making progress in a vast operation aimed retaking the Daesh-stronghold of Mosul in Iraq. In the past, Mediterranean city of Antalya, dubbed as "Turkey's tourism capital," hosted several NATO meetings, as well as the G20 summit in 2015.